Three projects for the bathroom. 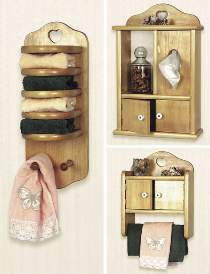 Big cabinet holds facial tissues as well as other bathroom accessories. A slightly smaller cabinet holds toilet paper and cloth towels. Guest towel project holds up to 4 folded guest towels. All patterns drawn FULL SIZE. Largest cabinet measures 21"H x 14"W x 5-1/2"D.***On special was $12.99 now only $6.49!